Now that the dust has settled, here are my thoughts about some of the fighters and what the impact is on future UFC betting. Chuck Liddell– As Rogan was said, Chuck had problems “getting off,” that’s a boxing phrase that’s used a lot when describing old fighters. Liddell is going to have big problems with any strikers that are quick and crisp punchers. Look to bet against him if he gets matched up with anyone but submission fighters. Keith Jardine- Continues to improve. His loss to Alexander did little to slow down his development. He is playable as an underdog against anyone in the division, but I would not lay odds with him (he will be overvalued if he faces some lesser opponents. He gets hit a lot still and anyone with power can rock him at any time. Not sure how would handle some of the submission guys, but there are not many at 205 anyway. Forrest Griffin- Similar progression to Jardine. Although he looks like a better all around fighter to me. His ground defense is better than I thought and he’s improved on his mental skills. His style is always going to put him at risk, but thats his game. Can compete with anyone and deserves consideration anytime he’s a dog. I feel better play him as a favorite than Jardine, but not at a high price. Shogun Rua– His performance was bad. He was soundly beaten by Griffin. I’m not betting his next fight under any circumstance, although I expect him to get things sorted out and come back strong. I’m giving him a pass on this fight and will re-evaluate after his next bout. Thiago Tavares-Ran into Tyson Griffin, whose fight very well. Tavares is a very good ground fighter that is constantly looking for submissions. Tavares should struggle with Sherk, Griffin, Stevenson but he’s good enough to handle all the other guys at 155. Watch for betting opportunities, he’s still fairly unknown and coming off a loss, he could have some value. Tyson Griffin– Fits in the top contender status, no doubt. He is a solid all around fighter that should be considered playable as a sizable favorite. Looks like he’s damn near unchokable and the only way I see him getting in real trouble is from a top quality puncher that can land some heavy combos then sub him, maybe Gomi? Hansen? 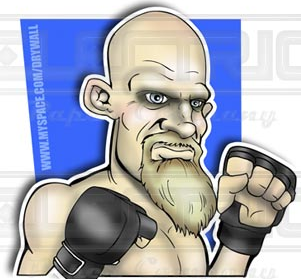 Keith Jardine is an American mixed martial arts fighter. He currently fights as a light-heavyweight for the Ultimate Fighting Championship. Jardine made his professional mixed martial arts debut in 2001, defeating Amir Rahnavardi via armbar submission. He would win five out of his next six bouts, suffering one knockout loss to Travis Wiuff, before debuting in the Japan’s Pancrase organization in 2003. Jardine’s bout in Pancrase, with Keiichiro Yamamiya, ended in a draw. Jardine defeated his next two opponents, including a submission win over Red Devil Sport Club fighter Arman Gambaryan. Jardine made his debut with the UFC on the reality TV series the Ultimate Fighter 2, where he was cast as a heavyweight under coach Rich Franklin. Jardine was one of the favorites to proceed to the Heavyweight division’s finals, but was not selected to fight until the semi-finals, where he was defeated by eventual season two Heavyweight winner Rashad Evans. Although Jardine was eliminated from The Ultimate Fighter 2, his tenure with the UFC would continue. Jardine made his first appearance on an official UFC fight card at the TUF 2 Finale, defeating fellow season two Heavyweight Kerry Schall by TKO due to leg kicks. Jardine subsequently dropped down a weight class to the Light-Heavyweight division, and defeated Mike Whitehead, another TUF 2 competitor, by unanimous decision at UFC 57. At UFC 66, Jardine scored a TKO victory in the first round over winner of The Ultimate Fighter 1, Forrest Griffin. Jardine’s next fight was against UFC newcomer Houston Alexander at UFC 71. After having complained about having to face an unknown fighter when he felt he deserved a more high profile match, Jardine was knocked out 48 seconds into the first round after a vicious assault by Alexander. Chuck Liddell is a mixed martial artist who currently fights for the Ultimate Fighting Championship. A former UFC Light Heavyweight Champion, Liddell has an extensive background in Kickboxing and collegiate wrestling. He is associated with the Pit team and recently earned a Purple Belt in Brazilian Jiu Jitsu. Because of his relaxed “hands-down” stance and the various angles from which he throws punches, many within the MMA community have labelled Liddell’s style “unorthodox”. He was a four-year starter on the football team at San Marcos High School, and Liddell is noted within MMA circles for his exceptional takedown defense. Liddell began his fighting career when he defeated Noe Hernandez on May 15, 1998. By 2002, Liddell was considered the number one contender for the UFC light heavyweight title with growing popularity and support from fans. The UFC tried to arrange a title bout with then champion Tito Ortiz but Ortiz kept citing scheduling conflicts which frustrated the UFC brass. To force Ortiz’s hand, they created an Interim Light Heavyweight Championship and matched Liddell with experienced former heavyweight Randy Couture at UFC 43 for that title. This was a fight that many thought Chuck should win, and it was expected that he would then go on to fight Orti. However, Couture neutralized Chuck’s trademark powerful looping hooks with crisp straight punches and he eventually began taking Chuck down at will. Couture eventually gained full mount and forced a referee stoppage due to strikes. After this defeat, Liddell went to Japan to compete in the PRIDE 2003 Middleweight Grand Prix tournament as the UFC’s representative. After defeating Alistair Overeem in the first round of the tournament, Liddell was eliminated from the Grand Prix by Quinton “Rampage” Jackson in the semi-finals in a one sided affair, losing by technical knockout after Liddell’s corner signaled for an end to the bout. Liddell lost his UFC light heavyweight title at UFC 71 on May 26, 2007 in a rematch against Quinton “Rampage” Jackson due to KO after being dropped by a single right hand. After the loss Liddell was widely criticized after reports indicated he was seen in night clubs the week before the event. He responded that it was nothing he had not done prior to his other fights in Las Vegas. Chuck returns to the ring at UFC 76, where he faces Keith Jardine (UFC 76 preview). Parlays are combination bets where it’s all or nothing., what I mean is that you must pick all the fights in your parlay correctly or you lose it. The more fights you have in your parlay, the higher the payoff. Parlays can be great when you win, because you make small bets to win big money. Who doesn’t like that? Currently two sites take MMA Parlays BetUs and 5Dimes. A couple of important points about parlaying fights. First, it becomes more important to find the betting site with the best odds. Your payout’s are multiplied (2.6x for 2 man, 6x for 3 man, 12x for a 4 man,) so the difference in a couple fighters listed at -120 instead of -140 can mean and additional $100 in your pocket. Here’s our Parlay Calculator to help you with payoff figures. Second, heavily favored fighters add very little value to the payout. So, lets leave them out of our parlays. The reward does not justify the risk or the anguish you will suffer after hitting 3 fights only to watch Matt Serra steal your treasure in the main event. I like to identify a fighter, or two, that I think is a very likely winner and make that fighter my “key.” I then use my key fighter to build several combinations. Tyson Griffin is my key for UFC 76. There are the combinations I like in the featured fights. All favorites this time. The last two UFC events I have had losing fighter as my key fighters (Hamill and Grove), it’s time to get things turned around. I have to stay patient and bet the ones I am confident in winning.